I read this Caroline and really liked it. I didn’t know the author had died. Very sad indeed. It is very sad. I want to try some of his other novels too. Thanks, Vishy. I highly recommend him but would start with his first Happy Birthday, Turk. Yes, he was only twenty when he published the first. It’s lucky, considering how young he died. That way, at least, we have some really great books. The style is terrific. Thanks Caroline. I will look for his first book ‘Happy Birthday, Turk’. 48 is such a young age to die. It is really sad. Some people start writing at 48. Thomas Hardy wrote nearly all his poetry after he turned 60 and he is regarded as one of the great poets of his time. He was a precocious writer. Reading his books now I can hardly belive he was that young. I love the Kayankaya novels, although I agree with you that Happy Birthday, Turk is probably the stronger one of the two first. 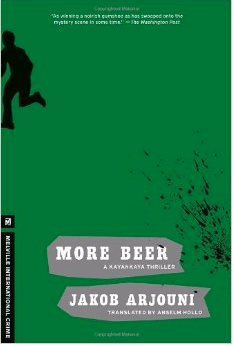 Nevertheless, also Mehr Bier is a great read. For those who have read already all Kayankaya novels, I recommend also Magic Hoffmann (that’s the original title in German!) which also has this specific Arjouni sound that make his books really unique. Thanks for that about Magic Hoffmann. I was wondering how close it was, style-wise, to his crime novels. I’ve got it and might read it this month. Or maybe the third in the series. Magic Hoffmann is also a kind of crime novel, but without detective. There are a few differences to the Kayankaya books, but still a typical Arjouni and I liked it indeed very much. It’s incredible that he was published at such a young age, but after reading your review, I can see why. When I lived in Germany years ago, Turks were treated like third-class citizens. I too hope it’s better now. I had forgotten about that aspect of the novels, although it’s very important. I suppose they are treated better by now but I couldn’t say. Nice review Caroline! I read this for German lit Month a couple of years ago having read it first some time in the 1990s and I think I saw more similarities with Marlowe than you did. It is a great krimi and an interesting insight to Turkish integration and acceptance in Germany at that point in their history. Despite Kayankaya being cruel to the rat, he is particularly sensitive towards the women characters, which I found balanced out the darkness of this book. Thanks, Sarah. I should have mentioned that Marlowe is my favourite fictional charcater and I ususally care more about other elements in books. So, being compared to him isn’t doing any other character any good. He’s not a misogynist. The integration part is very interesting and made me feel uncomfortable. I think that I could forgive a weak plot is the writing is good. Kayankaya also sounds like an interesting character. Generally, hearing a writer is the”answer” to another writer makes me cringe as originality is so important to me. I think that your highlighting the differences with Chandler is important. I could forgive the plot in this case. Using a character like Kayankaya was a good choice. It offers a lot of possibilities to see German society from another angle. Yeah, those comparisons. They rarely work. I do like Arjouni and am slowly working my way through Kayankaya all over again. I’m planning to read Ein Mann, ein Mord for German Lit Month and I never got around to reading the last couple of books. He does write well, doesn’t he? I’m looking forward to your review. I feel like picking up the next one. Or Magic Hoffmann. I think his first novel sounds more appealing to me. But then not all books have everything, if you can come away with something that you liked, that’s good enough. Like the writing for example. I agree. It wasn’t a disappointment or anything. But the first was really good in every way. So many writers get compared to Chandler and so rarely are those comparisons just. However, the recent Benjamin Black continuation novel of Philip Marlowe was properly excellent and actually just like Chandler! So I do recommend that. Sounds like this author’s first novel is the place to start with his work. Sad to hear he died so very young. Thanks you fot telling me about the Benjamin Black book. I’ll check that out. Yes, Arjouni’s first is the place to start. Very sad indeed. I remember it touched me quite a bit when I saw it. Hardboiled noir is about the only crime fiction I like. This sounded good until the part about the rat. It’s interesting that most readers would overlook cruelty to a rat, but probably not if it were a cat or dog being abused? It’s sad the author died so young. To be fair – the character gets attacked by the rat but . . . I’ll spare you the details. Just this – you don’t need to take it out on an animal. It just does what its animal nature tells it to do. Recently I’m more and more aware of abused animals and how often they are used to show a charcater’s depravity. There’s even a horrible scene in The Quest for Christa T.
Oh – and I had such a shock experience when I read Tim Winton’s In the Winter Dark. Three instances of cat abuse/torture in a 100 pages book.